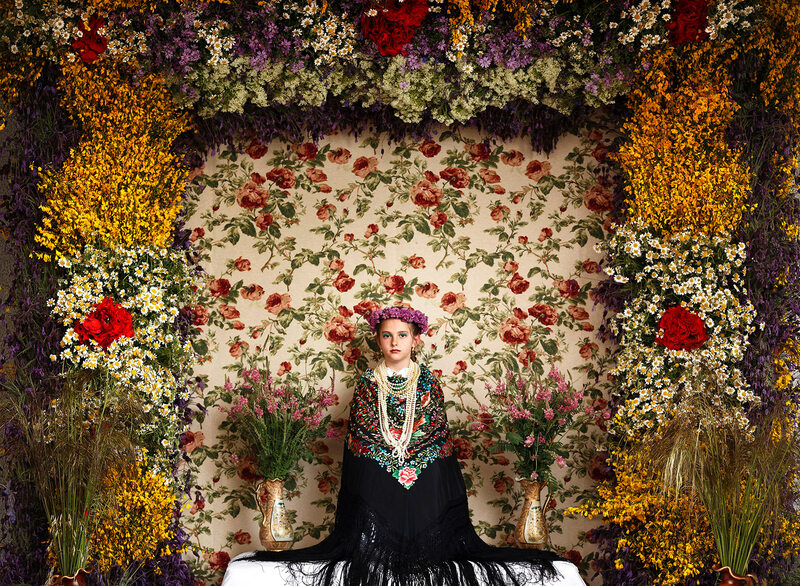 La Maya, Duna Puente Romera, 9, sits in an altar during the traditional celebration of 'Las Mayas' on the streets of Colmenar Viejo, near Madrid, Spain, May 2, 2015. The festivity of the Maya comes from pagan rites and dates from the medieval age, appearing in ancient documents and takes place every year at the beginning of May celebrating the beginning off the spring. A girl between 7 and 11years is chosen as 'Maya' and should sit still, serious, and quiet for a couple of hours on an altar placed on the street and decorated with local flowers and plants.While La Maya is hieratically sitting on her chair a local band plays music and other young girls dressed in white offer sweets bakery to the visitors in a festive atmosphere, afterwards they walk to the church with their family where they attend a mass ceremony.